Michael Holding is a former Test cricket fast bowler who represented the West Indies during a period where they monstered and intimidated opposition the world over. He would start with an incredibly long run-up, charging in with grace yet daunting speed, mesmerising batsmen as he hunted their wickets like a wolf. He was the fastest bowler of his time. The over bowled to Geoff Boycott in the Kensignton Oval in 1981 was one of the fastest, finest and most ferocious of all-time. In the dry summer of 1976 at The Oval in England, the pitch had become slow and flat. Holding charged in time after time with incredible pace and gun-barrel straight precision, recording 14 wickets for 149. It would be the best match bowling figures ever by a West-Indian, quite something given his contemporaries. 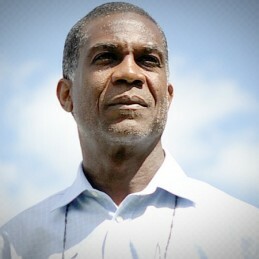 Michael Holding is now a well-respected and popular commentator who travels the world shedding light on the intricacies of the game and beguiling audiences with his articulate and distinctive Jamaican voice.